South Korean activists and North Korean defectors have regularly sent anti-Pyongyang leaflets that have also carried news about the outside world. “We … will send letters for our North Korean compatriots to mark the birthday of the national traitor who enslaved the people through three generations,” the Fighters for Free North Korea group, which is led by a defector, said in a statement. “Jong-Un … is using his father’s birthday to force North Koreans to pledge loyalty to him and to continue the family dictatorship,” it said, referring to the North’s new leader. Kim died of a heart attack in December aged 69 after ruling the impoverished but nuclear-armed country for 17 years following the death of his father and founding president, Kim Il-sung [who ruled for over 40 years], in 1994. Cut off by a relentless barrage of government shelling, activists in the besieged Syrian city of Homs have reverted to the age-old practice of using carrier pigeons to communicate with each other. The central city has been under a relentless barrage of heavy machine gun fire, tank shells, mortars and rocket-propelled grenades [from the Syrian army ordered by President Assad] since February 4. He carefully scrawls a message on a small piece of paper to his counterparts who are little more than [a mile] away in [the] Baba Amr [neighborhood of Homs], which has suffered some of the heaviest shelling. Despite only being a short distance apart, the activists say they are unable to venture very far because of checkpoints between them manned by security forces and the Shabiha, or pro-government thugs. The activists launched their uprising last March using social networking websites like Facebook and Twitter to rally support. They say they are now forced to use pigeons to communicate with each other in certain neighbourhoods of Homs out of the reach of their walkie-talkies. Apart from inquiring about what supplies are needed, Omar also jots down the names of people from the city killed in the latest fighting of the 11-month uprising. Syrians were among the first people to use pigeons as messengers and this was often the sole source of communication in the region. The Maldives president ousted in a coup [last] week has accused resort owners of plotting to overthrow him in reaction to his vision of a free – market paradise. Mohammed Nasheed said some owners of beach resorts on the Maldives financed the coup because they resented competition for contracts and [the elimination of tax loopholes]. He claimed that his own intelligence officers confirmed their involvement in the coup in a marriage of convenience with Muslim extremists. [Recently], the Islamists led street protests against the government’s decision to allow [the number of] massage and health spas to [grow]. Since he came to power in 2008, … Mr. Nasheed has privatized the country’s main airport, introduced compulsory private health insurance, and imposed a tax system to make the country self – reliant. “The coup was financed by resort owners … not just one but many,” he said. “They liked the old order of corruption. We were rocking the boat, taxing them. “When we came into government, revenue was $600 million, today it is $1.2 billion. Mr. Nasheed’s accusations were made before he met United Nations mediators. The Maldives, a collection of more than 1,100 coral-fringed islands surrounded by turquoise seas, is known as a "paradise" holiday destination that draws hundreds of thousands of travellers each year. The officials arrived in the capital Male to broker a political settlement between his Maldivian Democratic Party [MDP], the country’s single largest party, and the new government led by his former vice president Dr. Waheed Hassan. Mr. Nasheed rejected calls on Friday for him to accept a “national unity” government and warned of street protests throughout the Maldives unless new elections were held. …..
On Friday night he said he would lead a new protest in Addu, the islands’ second largest town, after reports of police raids on the homes of his party supporters and allegations that some were stripped naked and beaten. He disclosed that an intervention by William Hague, the [British] Foreign Secretary, had been crucial in turning international opinion in his party’s favour after he was forced to resign on Tuesday [Feb. 6]. “William Hague’s statement in Parliament was the first to signal there was a coup here,” he said. A court order for Mr. Nasheed’s arrest appears to have been quietly shelved after international protests led by Britain. The MDP [Maldivian Democratic Party] was formed under the tutelage of the [British] Conservative Party through the Westminster Foundation for Democracy. 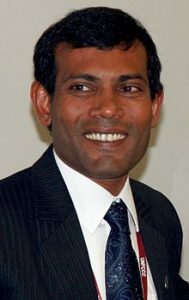 The British Cabinet Office minister, Francis Maude, had insisted Mr. Nasheed [run] against the country’s former president, Abdul Gayoom [who had ruled the country for 30 years], in 2008. He said an inquiry was necessary to establish whether Mr. Gayoom, whose 30 years of autocratic rule he ended with his 2008 election victory, was involved in the coup. Salafists, Islamic fundamentalists who share al-Qaeda’s philosophy, had dominated the street protests against his government because they opposed the rise of spas and massage services, he said. He had been forced to step down [resign] because these two opposing groups had made common cause against him. NOTE: Before answering the questions below, read the info under "Background" and watch the videos under "Resources." 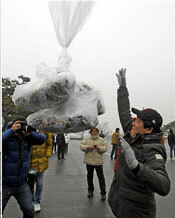 b) How is the North Korean government responding to the activists plans to drop leaflets into their country? b) Should the world community/U.N. help the Syrian government, its opponents, or neither? If so, what aid should be given. Explain your answer. b) What two groups does President Nasheed blame for being behind the coup that ousted him? Why does he say each group joined in? c) Read the background below about the Maldives. Do you support the Obama administration's decision to back the newly installed president Waheed Hassan, instead of the ousted Mohammed Nasheed, who had been democratically elected? Explain your answer. The 2011–2012 Syrian uprising is an ongoing internal conflict in Syria, a part of the wider Arab Spring, a wave of social upheaval throughout the Arab World demanding greater political freedom and an end to autocracy. Public demonstrations first took place in January 2011, but were only a sporadic occurrence until mass protests erupted in Daraa on March 15, 2011. The situation quickly developed into a full-scale nationwide uprising, with protesters demanding the resignation of President Bashar al-Assad and the overthrow of the government. Inspired by the successful revolutions in Tunisia and Egypt, Syrian protesters have employed the use of tactics such as marches, hunger strikes, rioting, and vandalism, in a sustained campaign of civil resistance aimed at ending nearly five decades of Ba’athist rule. The uprising was described as "unprecedented" by several political commentators. As protests continued, the Syrian government began deploying tanks and snipers as a means to quell the uprising. Water and electricity have been shut off in particularly restive areas, and security forces have resorted to confiscating flour and food. The Syrian Army has besieged [many] cities [including Homs]. According to witness accounts, soldiers who have refused to open fire against civilians were summarily executed by the Syrian Army. The Syrian government denied the reports of defections and blamed "armed gangs" for causing trouble. Since summer 2011, mutineers and army defectors formed fighting units, which began an insurgency campaign against the Syrian regular army. As a result violent clashes began across the country, increasing by the end of the year and the insurgents unified under the banner of the Free Syrian Army, showing increasingly organized fighting patterns. The Maldives, an archipelago [a chain or cluster of islands] in the Indian Ocean, is best known...as an exotic beach resort. Over the past week it has been involved in a political crisis in which President Mohammed Nasheed [says] he was forced to resign under pressure from the country's security forces, while his successor [Waheed Hassan, who was Nasheed's vice president] says his departure was voluntary. [Former] President Nasheed, the country’s first democratically elected head of state, has now called for early elections, [and says he will be fairly elected again]. New President Waheed Hassan, the former vice-president, wants a government of national unity and for the next election to be held, as scheduled, towards the end of 2013. Opposition to Mr. Nasheed comes from various quarters. Muslims disapprove of his attempts to improve relations with Israel and make alcohol more widely available. 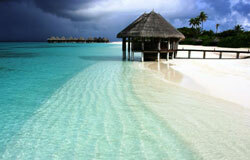 Resort owners object to his plans for closing tax loopholes in the tourist industry. There have been protests against rising prices. And over all of this hangs the shadow of [President] Abdul Gayoom, the autocrat whose 30-year rule was brought to an end by Mr. Nasheed in 2008. Most of the ministers appointed by [newly installed President] Hassan served under Mr. Gayoom. [The best way to resolve this conflict is for the Maldives to hold] an early presidential election. The voters should decide the fate of the former president. Regrettably, the Obama administration has backed [new President] Hassan’s option of [forming] a government of national unity. It is to be hoped that the Commonwealth Ministerial Action Group will present a stronger defense of democratic principles.